Give me a big bowl of mussels and a crusty baugette and I'm happy! Seriously. 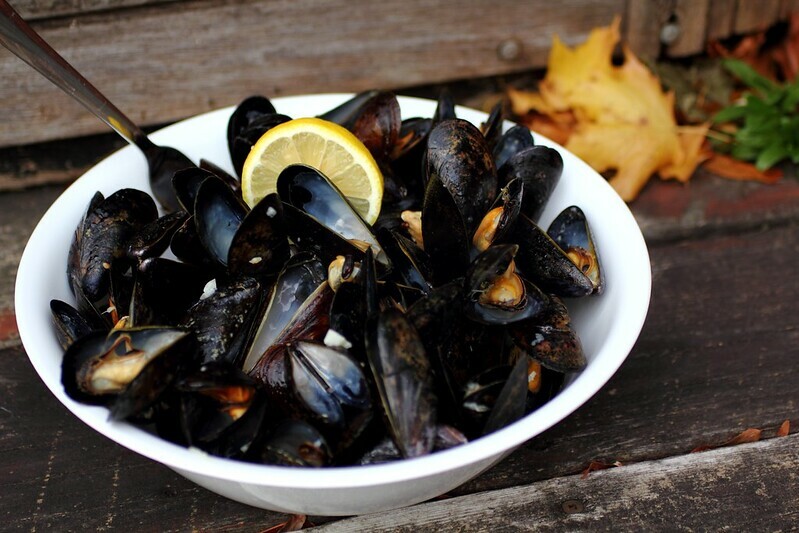 Mussels are one of my favourite foods, so easy to make (literally takes seconds) and can be flavoured in many ways. Think Mediterranean with chopped tomatoes, garlic, onion or something completely exotic like a green curry with coconut milk, or just keep it simple, garlic and parsley or just GARLIC and lemon then you can truly savour the flavour of the sea! If you've been eating mussels at restaurants and perhaps baking the frozen ones at home you need to upgrade and start making these in your kitchen, I promise, it's super easy! Fresh live Mussels that smell of the sea (Costco has them in a 2 Pack vacuumed sealed tub, just bring them home, pop them in your fridge and cook in the next couple of days) One pack makes one bowl that you see above, perfect as a meal for one person or to share as a side or "snack"
First sort your mussels and make sure they're all nice and closed, sometimes it takes a bit of time for them to wake up if they're cold from the fridge. Nearly my entire tub was good, maybe with the exception of 2-4 mussels that I threw away. In a large pot add olive oil to the bottom, on medium high sautee the garlic until fragrant. As soon as you get that garlicky whiff add your mussels in the pot. Turn the heat up to high, sprinkle a nice amount of sea salt. Now for the liquid, most people use white wine but you can absolutely use water, I just drizzle 3/4 of a cup or so and cover the pot with the lid. Transfer the mussels to a large bowl and pour over those delicious juices. Grab the bread, a couple of lemon wedges and grab your friends! ENJOY! I'm a twenty-something Canadian girl inspired by my rich & very diverse (Africa-Europe-Asia....) heritage! Join me here for an adventure in food, lifestyle and all good things with a touch of exotic. Thanks to my Sister !